What better way to prepare the All American Sloppy Joe sandwich than with McCormick's Sloppy Joe Seasoning Mix? 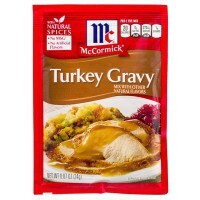 A zesty blend of herbs and spices that you simply add to ground beef or turkey for a quick lunch or dinner option. 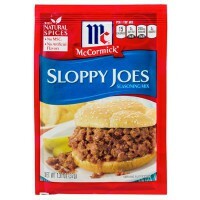 MacCormick's Sloppy Joes Mix is a gotta-have for your pantry. 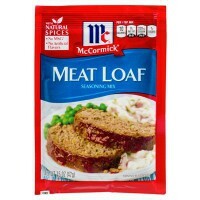 Sugar, onion, salt, corn starch, spices (paprika, chili pepper), red and green bell peppers, garlic, maltodextrin from corn, acidity regulator E330, vinegar solids, natural flavor. 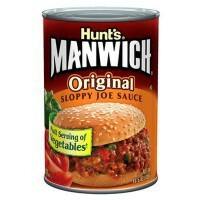 Contains GMO. Nutrition facts (for 100g): calories 333Kcal, total fat 0g (saturated fat 0g), total carbohydrate 66.7g (sugar 44.4g), protein 0g, salt 15.6g.